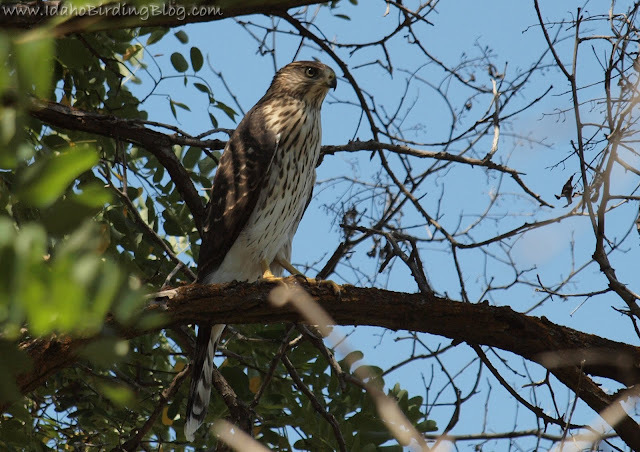 This hawk was actively hunting other birds among the trees. Back at the end of July of this year I made my first visit to Foote Park near Lucky Peak Reservoir. I had often seen reports of the great birding in this area and I was anxious to visit. Foote Park is a fairly narrow draw running north to south, and is a little oasis of green in the southern Idaho desert. Its not but a few miles out of Boise, but remains a largely under-birded location. IBLE reports, combined with eBird records show that Foote Park is an excellent location for flycatchers, vireos, and warblers during migration including American Redstart and Black and White Warbler. It is also a location where Lesser Goldfinch are occasionally seen in Idaho. While I was there for less than an hour, I still registered 18 species including Warbling Vireo, Gray Catbird, Yellow-breasted Chat, Bullock's Oriole, Lazuli Bunting, and Western Tanager. Locust Trees, willows, and a few cottonwoods make this draw an oasis for birds in the southern Idaho desert.